OK, so now we know: the Democratic Party of Japan has a death wish. When Prime Minister Abe Shinzo is invoking, on seemingly an hourly basis, the need for greater opportunities for women not just in Japan (Link) but everywhere (Link and Link), and he is slotting women into a record number of cabinet and Liberal Democratic Party posts (Link), when the international discussion on Japan is focusing on the country's ridiculous underutilization of women's talents and energy (Link), the DPJ responds with a new leadership council compose of dudes, dudes and nothing but dudes. There is such a thing as optics. 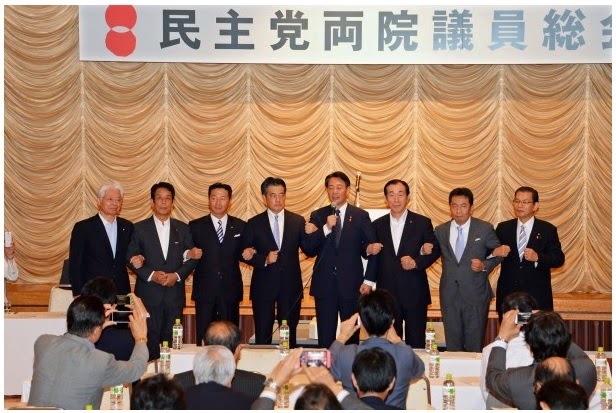 Truly, the new DPJ leadership group (above photo) is excruciating to behold. Nyah, nyah, nyah, nyah, nyah -- same as you! However, getting caught with arms up to his elbows in the cookie jar sank Watanabe's plans for a glorious hawk-hawk-hawk superalliance supplanting the LDP/New Komeito ruling coalition -- because it became apparent once he resigned as party leader that the only real link between the LDP and the Your Party was the personal one between Watanabe and Abe Shinzo (Watanabe being one of the four-member "Abe Road" group of Abe and his most trusted political allies). I know what you are thinking: Japan's opposition parties cannot, cannot be as pathetic as they seem here . There must be some glimmer of hope somewhere -- like the appointment of Edano Yukio as the DPJ's secretary-general giving a clear sense that Edano will succeed the hapless Kaieda Banri as party leader. Yes, it is true, the Edano appointment provides a glimmer of hope. But only a glimmer. When lumped together with the amazing sublimating Socialists and the cash-burning Communists, Japan's opposition parties are a mind-boggling flaming heap of wasted time and talent. Which has got to represent a huge temptation for Abe Shinzo to shuck his newly minted Cabinet and call a snap election of the House of Representatives -- after, that is, he signs off on the second raising of the consumption tax from 8% to 10%. Image courtesy: Democratic Party of Japan official website.